Jurassic World: Fallen Kingdom is a 2018 American science fiction adventure film and the sequel to Jurassic World (2015). Directed by J. A. Bayona, it is the fifth installment of the Jurassic Park film series, as well as the second installment of a planned Jurassic World trilogy. Derek Connolly and Jurassic World director Colin Trevorrow both returned as writers, with Trevorrow and the original Jurassic Park director Steven Spielberg as executive producers. 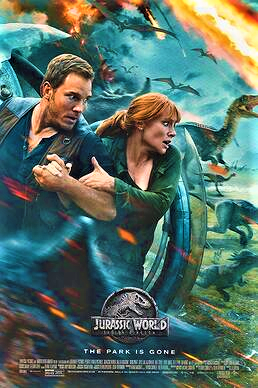 Chris Pratt, Bryce Dallas Howard, B. D. Wong, and Jeff Goldblum reprise their roles from previous films in the series, with Rafe Spall, Justice Smith, Daniella Pineda, James Cromwell, Toby Jones, Ted Levine, Isabella Sermon, and Geraldine Chaplin joining the cast. Set 3 years after the events of Jurassic World, a small team of mercenaries arrives on the abandoned Isla Nublar to collect DNA from the remains of the Indominus rex at the bottom of the park’s lagoon. After successfully collecting a bone fragment, the team’s survivors barely escape the island following attacks by the Mosasaurus and Tyrannosaurus rex. As a US Senate hearing debates whether Isla Nublar’s dinosaurs should be saved from an impending volcanic eruption. Mathematician Dr. Ian Malcolm testifies that the dinosaurs should be allowed to perish to correct John Hammond’s mistake of cloning them. Hammond’s former partner, Benjamin Lockwood, summons Claire Dearing, who has started the Dinosaur Protection Group to save the animals, to his Northern California estate. Lockwood and his aide, Eli Mills, reveal a plan to relocate the dinosaurs to a new island sanctuary and Claire is needed to help reactivate the park’s dinosaur tracking system to locate the animals, particularly Blue, the last surviving Velociraptor. Although they are estranged, Claire recruits Jurassic World’s former Velociraptor trainer and Blue’s alpha, Owen Grady, to help capture her. Things go wrong and it turns out that Mills has hired a mercenary team led by Ken Wheatley to capture 11 dinosaurs on the black market. They also use Blue. They will also unveil the Indoraptor, a new genetically-modified dinosaur created by geneticist Dr. Henry Wu using Indominus rex and Velociraptor DNA. Wu wants Blue’s DNA to create an enhanced Indoraptor but after Blue is shot and bleeding badly, paleo-veterinarian Zia Rodriguez uses T-Rex blood, that Owen and Claire took from a doped up Rex, for a transfusion. At the Lockwood’s estate, Mills & Gunnar Eversol auction the dinosaurs and the Indominus rex fetches a royal sum of $30 million. After his granddaughter, Maisie, informs Lockwood about the auction, he confronts Mills, who murders him. Maisie is later revealed to have been cloned from Lockwood’s deceased daughter and is the reason John Hammond, who opposed human cloning, ended their association. The dinosaurs are transported to Lockwood’s estate and caged. Zia and Franklin narrowly evade capture, but Owen and Claire are apprehended and confined. Owen incites a Stygimoloch into breaking open their cell. They find Maisie, who leads them to the auction where the Indoraptor is being sold despite Wu’s protests that it is a prototype. Owen disrupts the proceedings by luring the Stygimoloch into the room. In the ensuing chaos, Wheatley tranquilizes the Indoraptor to extract a tooth as a trophy, but it feigns sedation and escapes, killing him, Eversol, and others. The Indoraptor hunts Owen, Claire, and Maisie throughout the mansion. Zia releases Blue, who attacks the Indoraptor, causing it to fall through a glass roof to its death. When a hydrogen cyanide gas leak threatens the caged animals, Maisie is unable to let them die and frees them, despite Owen’s objections. The Tyrannosaurus devours Mills and tramples the Indominus bone, destroying it. Owen, Claire, Maisie, Zia, and Franklin escape safely, while Blue and the other dinosaurs escape. In a new U.S. Senate hearing, Dr. Malcolm declares the beginning of a Neo-Jurassic Age, where humans and dinosaurs must learn to coexist. The closing scenes show the freed dinosaurs roaming wilderness and outer urban areas. To be honest this film did not capture my attention and imagination the way the first two did and the previous movie did. It just lacks actual thrilling moments and is kinda predictable to be suspenseful at all. I do love the way they did the dinosaurs. I give it a 7.5 outta 10!